There are some ingredients that you almost can’t go wrong with in DIY skincare. And honey is definitely at the top of the list. This kitchen pantry staple has been used in food and medicine since the Stone Age. Here’s why your skin loves it, too. Honey is naturally antibacterial, which helps your skin fight off acne. Plus it has an an amazing antioxidant capacity, and you want antioxidants around to combat the free radicals that damage the skin. 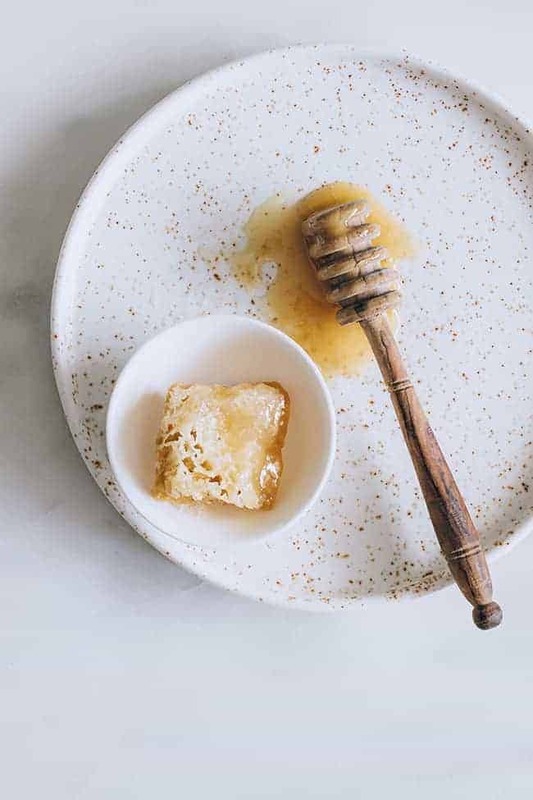 Honey is a natural humectant that draws in moisture from the air, leaving your skin moist and smooth, and it can also help break up excess sebum that might be clogging up your pores (and leading to pesky pimples). You’ll get the most benefits using raw honey. And if you’re willing to splurge, you can’t beat Manuka honey. This honey from the Manuka tree in New Zealand and Australia is an antibacterial superfood with tons of immunity and first-aid benefits. Keep a jar around and dab the honey on acne, burns or minor cuts. And if you’re feeling sick, take a spoonful or two. We all spend money on skincare products so skip the fancy serum and splurge on good honey. You can use it to wash your face, make a scrub, or treat your skin to a weekly homemade honey mask. These masks are perfect for an at-home facial. Start with clean skin and before applying the mask, lay a warm, wet wash cloth on your face to open up your pores. After rinsing off the mask, wash your face with cold water or use a toner to close the pores. Then apply a good face oil. Here are 5 simple recipes to get you started. Find the one that works for your skin type or the problem you want to address. Dermatologists love baking soda because it’s both anti-inflammatory and antibacterial. Combine it with exfoliating lemon juice and soothing honey and you have a gentle but effective mask to help prevent acne. Add lemon juice, honey and baking soda to a small bowl. Mix well and apply over the face and neck. Avoid the area near your eyes (lemon juice and honey will both sting). Don’t turn this into a scrub by rubbing it into your skin. After 15 minutes, remove the mask with warm water, then with cold water. A caution when using lemon juice: Lemon can also make the skin photosensitive. Rinse your face thoroughly and use sunscreen if you’ll be out in the sun soon afterward. Green tea and honey work anti-inflammatory magic on skin redness and inflammation. This soothing combo is gentle enough for sensitive skin (do a patch test if you’re worried). Both ingredients are potent antioxidants to fight free radicals and repair skin damage. Combine matcha powder, honey and oil in a small bowl and mix well. (If you don’t have matcha powder, cut open a green tea bag and use the leaves.) Apply this to the face and leave it for 15 minutes before washing off warm water. Turmeric masks are commonly used to even out skin tone and reduce the appearance of dark spots or scars. Honey adds a slight bleaching effect while lemon juice and yogurt gently exfoliate to get rid of dead skin and encourage new cell growth. Mix all ingredients together in a small bowl. Apply a thin layer over your entire face and neck. Rest for 20 minutes and rinse with warm water. Repeat the mask weekly or use the mixture as a daily spot treatment by dabbing it onto discoloration. Results will take 2-3 months. Clay masks are awesome for controlling oily skin. Honey helps break up excess oil and highly absorbent clay removes it while gently exfoliating. Bentonite and Moroccan Red are two of the best clay choices for balancing oily skin. Combine clay, honey and apple cider vinegar in a small non-reactive bowl (never use metal when working with clay). Stir together and gently apply to the face and neck. After 15 minutes, remove the mask with warm water, then with cold water. Honey and avocado are the perfect combo of hydrating ingredients for dry skin. Ground almonds gently exfoliate, and their good fats leave your skin feeling super soft. If you want to add even more moisturizing benefits, add a tablespoon of oil to the mix. Add honey and avocado to a small bowl and mash together. Stir in the ground almonds. Spread over the face and neck and after 15-20 minutes, rinse with warm water. For more honey ideas, try honey and cinnamon for brighter skin or honey with cocoa and cream to exfoliate. How long can you store this in a small cream container? Meaning what’s the shelf life roughly ? What can I substitute baking soda with or can I just not use it at all? Thanks for always providing great information. I would love to try the turmeric mask – just wondering if it won’t shade the skin tone to yellow. Turmeric masks have a regular place in my beauty routine — I do them once a week. They’ll leave a slight yellow hue on the skin, but that fades in about 30 minutes. If you notice residue after the 30 minute mark, you can soak a cotton ball with milk and go over those areas. I think I’ll actually combine 3 and 4 because I have dry and inflamed skin. One of the perks of using such ingredients is that they won’t react badly together like atore bought ones might!